Da Bears Blog | Does Charles Tillman belong in the Hall of Fame? Does Charles Tillman belong in the Hall of Fame? Longtime Chicago cornerback Charles “Peanut” Tillman was placed on season-ending injured reserve this week after he tore his triceps against San Francisco this past Sunday. This marks the second season in a row Tillman’s season ended early due to the injury. With two straight injury-shortened seasons and a contract that expires at the end of the season, this seems to be the end of the road for the 33 year old cornerback, though Tillman has vowed his career is not yet finished. If Tillman has indeed reached the end of his career, he has nothing to be ashamed of. The 2003 2nd round pick has played 12 years, all for the Bears, and generally played at a very high level. He reached two Pro Bowls (2011 and 2012), was named a 1st team All-Pro once (2012), and holds franchise records for defensive touchdowns (9), interception return yards (675), interceptions returned for touchdowns (8), and forced fumbles (38). Tillman also owns the franchise forced fumbles record for a single season (10, tied for NFL record) and single game (4, NFL record). There is little doubt that Tillman is the greatest cornerback the Chicago Bears have ever had, which is no small feat considering the illustrious defensive history of the franchise, but a more interesting question posed to me by Lorin Cox was this: does Charles Tillman belong in the Hall of Fame? This is a difficult question to answer as there are a number of factors that go into a player’s Hall of Fame candidacy. Let’s start with a look at the numbers, which were kindly provided by Lorin. 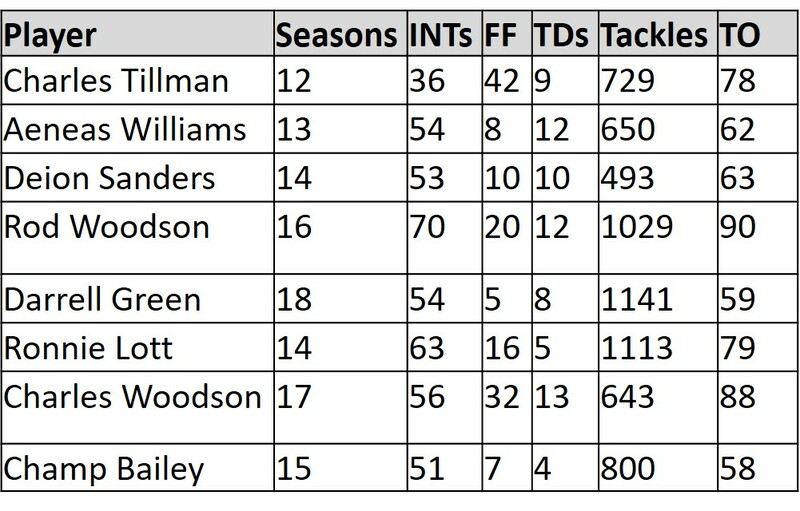 The table below compares Tillman’s vital statistics to those of several recent defensive backs who were inducted into the Hall of Fame, as well as two active players who will undoubtedly go into the Hall of Fame after they are done. Note that all of the above statistics about Tillman’s franchise records above are from the official Wikipedia page listing Chicago Bears records. These may differ slightly from the stats listed in the table below, which are from Pro Football Reference. Looking at these numbers, two things stand out. First, if this is indeed the end of Tillman’s career, he did not play for as long as most of his compatriots. This will hurt his volume numbers some and may damage his Hall candidacy. Second, Tillman’s numbers absolutely stack up, even on a volume basis. He has more tackles and defensive touchdowns than three of the other seven players and has forced more turnovers than four of them. His forced fumbles stand out well ahead of the group, thanks largely to his signature “Peanut Punch.” If there is one place where Tillman is clearly lacking, it is in interceptions; his 36 falls well short of the rest. When you look at per-season numbers, however, Tillman’s case begins to look even better, as you can clearly see in the table below. His 3.27 interceptions per season fits in nicely, and his forced fumbles per season dwarfs everybody else. Tillman rates well against his peers in both tackles per season (2nd) and turnovers per season (first by a mile). Of course, there are many more factors to consider than just numbers when evaluating a player for the Hall of Fame, especially for defensive players who are not pass rushers, as statistics often fail to accurately reflect their play. We’ll start with the areas where Tillman excels before moving on to where he might struggle. The 50 media members who vote for the Hall of Fame often take off-field actions into account, and Tillman’s sparkling record there can only help his cause. Tillman was named the NFL’s Walter Payton Man of the Year in 2013 and has a long history of charity work and community involvement in Chicago. He seems like a genuinely nice guy who everybody likes and respects, which can go a long way in the voting room. Tillman also has a well-publicized signature play, the Peanut Punch. This has increased his national profile and should help him get votes as well. The Hall of Fame is partially about telling the story of the NFL, and being well known for something that coaches now try to teach their players helps make it easier to consider you an important part of that story. But there is one essential area where Tillman is very lacking that I think will ultimately keep him out of the Hall of Fame. Tillman has simply not garnered enough national awards for his play. He has only been to two Pro Bowls and was only named an All Pro-1st or 2nd team-once. It will be extremely hard for the national media to convince themselves that Tillman was one of the best players of his generation when he was only considered one of the best four players at his position one time in his entire career. If he had been voted to a bunch of Pro Bowls, that might help overcome the lack of All Pro nominations, but alas, that did not happen. It seems kind of silly that a popularity contest based on fan voting would be a factor in determining who is worthy of the Hall of Fame, but that does indeed appear to be the case. Now that I’ve told you that I don’t think Tillman will make the Hall of Fame, I’m sure some people are wondering if I think he should. I’m sorry to say that, when looking at things objectively, I don’t. Tillman was a very good player for a very long time, but I don’t think he was consistently great. Therefore, I don’t think Tillman belongs in the Hall of Fame, as much as it pains me to say it. To me, Tillman is the definition of a guy who belongs in the Hall of Very Good, a term I believe was coined by Peter King (though I cannot find a source to confirm this). He was a very good player and a great man, but is just not quite at the caliber of somebody who deserves to be immortalized in the Hall of Fame.